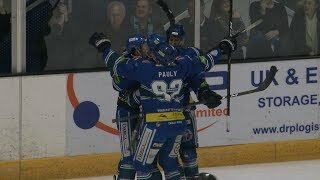 Three goals in the middle period were enough for the Genting Casino Coventry Blaze to secure a 3-2 home victory over Guildford Flames in the Challenge Cup. Coventry were again without Associate Captain Ross Venus, whilst the Flames chose to make a change from the night before, starting former Dundee Stars' netminder Travis Fullerton in place of Chris Carrozzi who took on the back-up duties. Blaze goalie and Man of the Match Miika Wiikman, who faced 31 shots over the night, was first beaten at 12.39 by Kruis Reddick, giving the away side a 1-0 advantage after 20 minutes. Captain Kevin Morris tied the game early in the second (22.53), before Ben Lake gave Coventry a 2-1 lead shortly after (24.45). At 25.56, Jamie Crooks took advantage of a Blaze breakdown , beating Wiikman high for a score of 2-2. After breaking his duck the night before, the game winning goal came from Kelin Ainsworth at 39.19, the Canadian celebrating emphatically in front of a jubilant Skydome crowd. 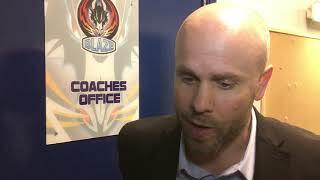 With no scoring in the third period, Blaze celebrated a 3-2 victory and a very welcome two points after the first weekend of Challenge Cup action.